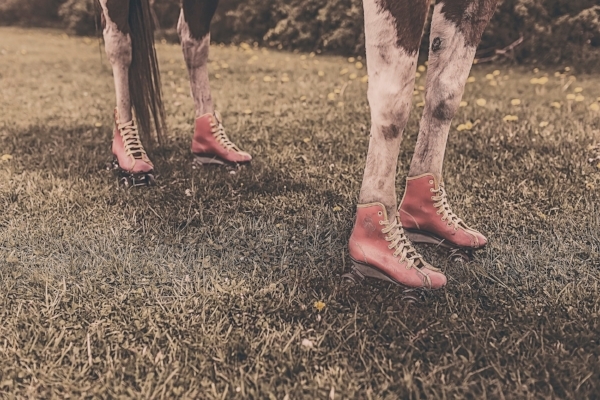 Managing Editor Krys Malcolm Belc on our first short-short of the year: In this masterful short fiction, Cathy Ulrich writes of geometry homework left half-finished on the table, a distraught mother, and the eerie echo of horses’ hooves in the wake of a murder. The piece sticks with me not only because of these details, but also because of its deft exploration of how we consume and perceive violence against the women in the stories we read and watch. The thing about being the murdered babysitter is you set the plot in motion. Your geometry homework will still be on the Harrisons’ coffee table, a boy’s name written on the grocery-bag cover, traced again and again with black pen. Mrs. Harrison came home tipsy, she’ll say tipsy, husband’s arms supporting her, giggling like a girl, tangled hair catching on her wedding ring. She won’t remember if you were still there when they returned, won’t remember if you needed a ride from Mr. Harrison or if you said you’d walk, sometimes you did that, just a couple blocks away, quiet neighborhood, safe. It was our anniversary, Mrs. Harrison will say. We were celebrating. The kids loved her, she’ll say. You drew them pictures of horses that they pinned to their walls, taught them how to swear in Japanese. After your death, the Harrison children will say kuso, kuso, ride ghost horses through the house. Mrs. Harrison will think she hears the beating of hooves, touch Mr. Harrison’s forearm, do you hear that? It’s just the children, he’ll say. Mr. Harrison will be interrogated for hours, interrogated, Mrs. Harrison will say, left hand twitching, like a criminal. He’ll say he gave you a ride. He’ll say he let you off at home. The police will push Styrofoam cups of steaming coffee across the table to him. The police will talk to him like equals, like friends. One will have a wife in the PTA at his children’s school. Did you wait to see if she got inside? Mr. Harrison will say yes, will say I think so, will finally say I don’t remember. I had a glass of wine, he’ll say. Maybe two. He’ll say: I probably shouldn’t have been driving. When the police talk to your parents, your mother will say: My baby. She’ll say my baby, my baby, my baby. The youngest of your four older brothers will sit on a bench at the station beside her. He’ll blink and blink and chew on a stick of gum from your mother’s purse. He’ll stay seated on the bench when the police come out with Mr. Harrison, when your mother throws herself at him like they do on television, beat her hands against his chest, my baby. Mr. Harrison won’t be able to look at your mother, won’t be able to step away from her tiny, flailing fists. Mr. Harrison will try to say I’m sorry, I’m sorry, but his mouth will only open and close without a sound. Mrs. Harrison will do the laundry after your death, run the linens through the wash again, again, again. Do these smell musty to you? she’ll ask Mr. Harrison. Mr. Harrison will say they don’t smell like anything at all. I’ll wash them one more time, Mrs. Harrison will say, just in case. She’ll fold the sheets in the youngest child’s bedroom, keep an eye on the drawings of horses pinned to the wall. She’ll think how alive they seem, as if the paper is only barely holding them back. She’ll remember how much her children loved horses after you started babysitting, how the youngest told her the names of the ones in the drawings: Charley Chase, Marion Davies, Max Linder. She’ll think the names are familiar, think maybe they were people once, long ago. The youngest child will come back to her room, find Mrs. Harrison still there, folding and refolding sheets. These horses, Mrs. Harrison will say. Are they real horses? Mrs. Harrison will swear she can hear hoofbeats, will say to her youngest: You hear it too? Mrs. Harrison will think of the name written on your geometry book, the dedication inherent in the tracing. She must have done it every day, she’ll say to her book club, goblet of red wine in her hand. She must have been, Mrs. Harrison will say, so in love. Mrs. Harrison will hear the beating of hooves, Mrs. Harrison will be beset by phantom horses, will insist on taking down every one of your drawings from her youngest’s room, over the child’s protests, march them out to the garbage. It’s not horses, Mr. Harrison will say after rescuing the drawings in the evening, smoothing them out, laying them on the youngest child’s bed. What is it, then, Mrs. Harrison will say, and her husband will put his hand to her chest, and she will feel his warmth, feel her own racing heart, the way her pulse is pounding in her ears. Cathy Ulrich's favorite babysitter let her stay up one time and watch a television show her parents didn't approve of. She named all her stuffed animals after that babysitter. Her work has been published in various journals, including Pithead Chapel, Cleaver, and Cotton Xenomorph.